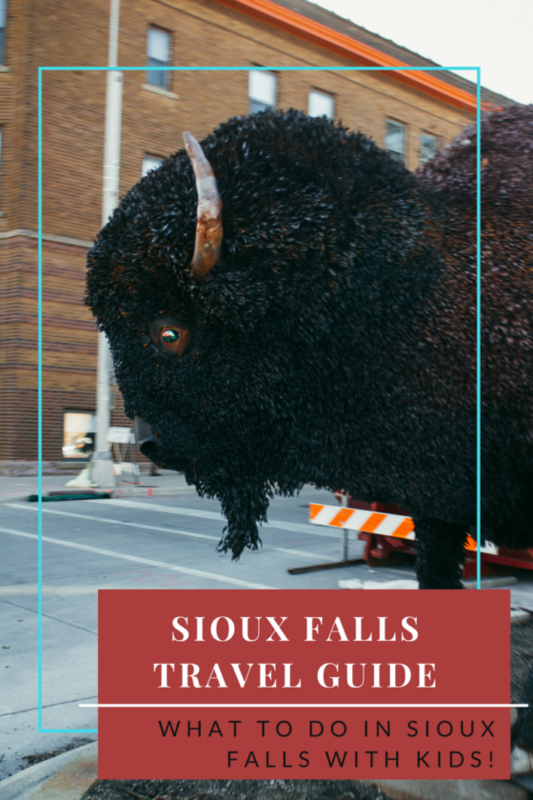 This Sioux Falls travel guide will give you the lowdown for what to do in Sioux Falls with kids. Sioux Falls is really an off the beaten path gem. 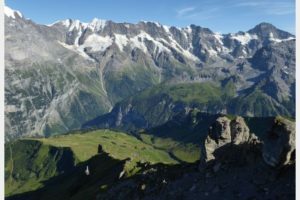 It is one of those places that quite honestly doesn’t make it onto most people’s travel bucket list (but probably should!) This up and coming travel destination has something to offer for urban explorers, adventure seekers, culture-lovers and families like YOURS! I am generally of the opinion that almost EVERY town, no matter how small, has something worthwhile to see, do or eat. In the case of Sioux Falls, you don’t need to look very far (literally). This budget friendly, mid sized town has a TON of family friendly choices that are relatively close together and easily accessed via car or public transit. 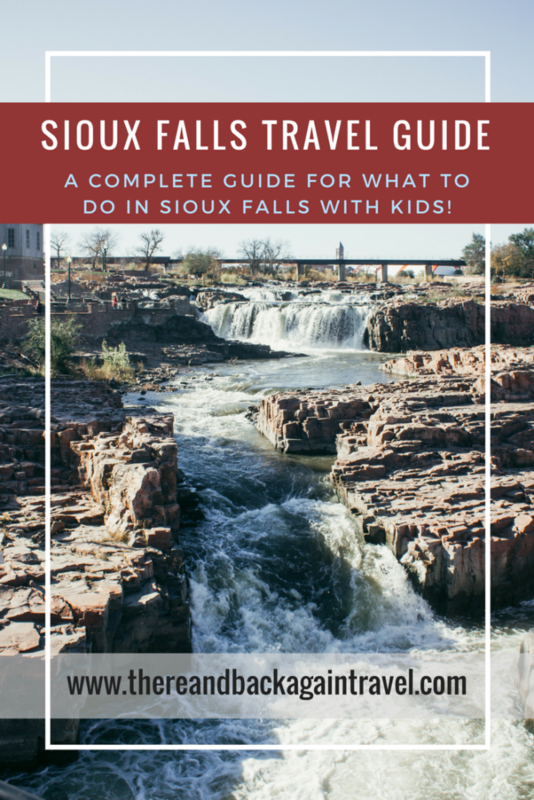 Now, without further ado, a Sioux Falls travel guide focusing specifically on what to do in Sioux Falls with kids! One cannot make a complete Sioux Falls Travel Guide of what to do in Sioux Falls with kids without mentioning this engaging Midwestern gem’s namesake – the falls. 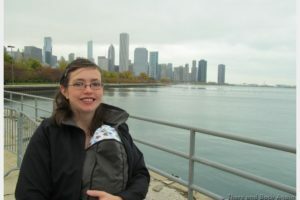 This video, courtesy of Jenn @ http://daytripper28.comFor a long time, I did not connect Sioux Falls in my head with an actual waterfall. Sioux Falls’ namesake is a sight to see and it the center piece of a massive 42 acre park that has been at the heart of the city since it was founded in 1856. Moonlight Movies are offered during the summer at nearby Fawick Park. They are free and are a great way to spend a summer night in Sioux Falls. Check with the Sioux Falls Convention and Visitors Bureau for current schedule! Climbing to the top of the observation tower in Falls Park is a must do while visiting Sioux Falls. The climb will yield panoramic views of the falls and the city. Falls Park is the home of the Fall’s Park Farmer’s Market. The market showcases the best of good old fashioned Midwestern produce, meats, cheeses and other goodies. It is open Saturdays from 8am-1pm from May to October. Looking for an excuse to love winter? The Winter Wonderland at Falls Park is as much of a reason as I can think of. The park is transformed each winter by the addition of 350,000 + Christmas lights! The falls itself is dressed up in colorful lights (and you can get a birds eye view of it all from the top of the five story observation tower). Sure to be a family favorite! Last but not least, for those looking to explore further, the Big Sioux River Greenway runs through Falls Park. This 26 mile paved trail starts in the park and meanders through the city. This is a great Sioux Falls attraction for families, particularly during winter or inclement weather. The Butterfly house offers the opportunity to see various butterfly species from all over the world close up. In the aquarium, your kiddos can “oooh” and “aaah” over hundreds of different species of fish and coral. In addition, they can get hands on in a shark and stingray tough pool and a tide pool. We love opportunities for our kids to engage with nature. This is why I LOVE the Sioux Falls Outdoor Campus! The Campus is located near the Butterfly House and Aquarium listed above and Sertoma Park below. The campus offers hands on activities throughout the year to educate kids about nature and teach them skills for outdoor recreational activities that they can enjoy for a lifetime. They offer classes and activities for preschool ages through adults. It is definitely worth it to check their schedule to see if any activities of interest coincide with your visit! Plan a day to visit the outdoor campus and include a visit to adjacent Sertoma Park. Sertoma Park has the city’s largest playground. This is an ideal spot to plan a picnic lunch or dinner and let the kids run off a little steam! The Storyland Children’s Theater offers plays for children throughout the summer. The plays are free and are performed at Mckennan Park. This would have been enough for me to warrant a visit with the kids. In addition to this, according to the store website, they also offer “a nostalgic shooting gallery, Big Buck Hunter, SCHEELS Bowling Alley, a 5 Sport simulator with sports including basketball, soccer, hockey, baseball and football”. This is a MUST if you have sports lovers in your family! 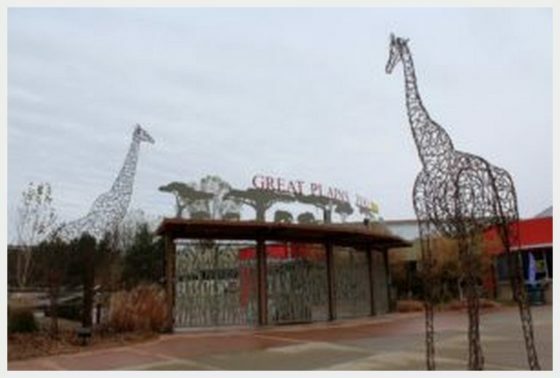 The Great Plains Zoo in Sioux Falls offers tons of animals, lots of hands on activities and plenty of shade while walking around. Included in your admission is the Delbridge Museum of natural History (inside of which is an indoor playground, perfect for when you just need to recollect and regain your sanity drinking coffee while the kids run off their sugar rush in a safe, contained environment). As far as zoos go, the admission fees for this one are pretty reasonable. Check it out! This kitschy piece of America wild west history is located just a few miles outside of Sioux Falls. Buffalo Ridge features animatronic exhibits that will give your kids a glimpse of life in the wild west. While the exhibits have purportedly fallen into disrepair, this kitschy cowboy ghost town might still be worth a stop. Knowing my kids, they would probably think that the talking robots were the highlight of their trip and the stop will likely yield some cool photo opps. The Midco Aquatic Center has a great kid pool with slides for tiny people. They have a larger slide and lily ads that can be traversed for older kids needing a bit more stimulation. It has a current channel, a warm water therapeutic exercise pool and lots of space for swimming laps. The Wild West Water Park is a destination water park entertainment complex. The water park offers a variety of attractions for all ages of children. The baby pool and Caribbean Falls offer a safe, fun space for babies and toddlers. A wave pool activity pool and waterslide complex round out the offerings for older kids. In addition, the park offers go karts, bumper boats and mini golf. The waterpark is a perfect place to spend a summer day in Sioux Falls! The Sioux Empire Fair takes place each August at the W.H. Lyons Fairgrounds and Expo Center. Agriculture, great food, antiques, crafts and great Midwestern kitsch come together in a celebration of all that makes the Midwest great! What I love about the Sioux Empire Fair in regards to visiting with kids is that it looks like it is big enough to have all of the bells and whistles without being overwhelming. This Sioux Falls food staple really is a must see on your visit to Sioux Falls. 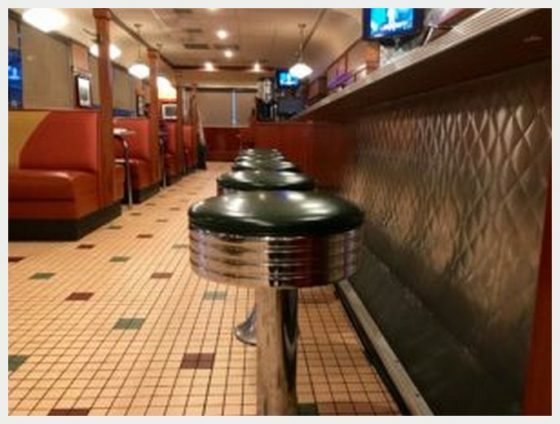 This well loved local diner serves up plates of classic Americana – burgers heaped to the sky, milkshakes and delectable, greasy spoon breakfast option served all day long. The atmosphere is as good as the food. Lots of chrome and neon. Old school lunch counter. The kids will LOVE this place. Almost guaranteed. Eat here during you stay. Maybe more than once. Enough said. The B & G Milky Way is a Sioux Falls original since 1954. The first location opened was opened up by Bertha and Guy Higgens, serving up soft serve ice cream, footlongs and other yummy treats. Since then, the B & G Milky Way has grown into other locations in Sioux Falls, but they work hard to maintain the old fashioned values of good food and great service. This would be a great place to plan a stop at for quick food and a sweet treat. This non chain favorite offers a robust menu of pizzas and pastas sure to please every palate. Quick service and reasonable prices round out this choice as a top choice for families looking for restaurants in Sioux Falls. I think I would plan a trip to Sioux Falls JUST to go here. Seriously. 20 different varieties of home made cookies, served with a cold glass of milk? SIGH. I think I am in love. If you need more convincing, here is a link to the Road Food review of this family owned Sioux Falls marvel. Popcorn is always a win when you are traveling with kids. A bag of popcorn can go a long ways towards keepings hands and mouths quiet for a little bit so you can regain your sanity. Enter Poppy’s Popcorn. Poppy’s has flavors to suit every taste (chocolate cherry, caramel apple and confetti…yum!) Stop in and buy a bag of peace and quiet while supporting a small, local business. I don’t EVER recommend a hotel on this blog that isn’t a place that we would stay with our own family. 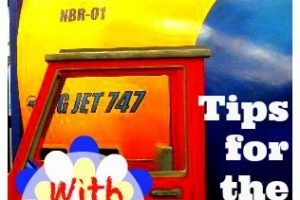 When traveling with kids, cleanliness and safety are hugely important to us, closely followed by good service and other family friendly amenities. These hotels should be on your short list when looking for where to stay in Sioux Falls! Holiday Inns are great options for families. Kids under 12 eat free in the restaurant (up to 4 kids per room). This Holiday Inn also has an indoor heated pool. One of our favorite planning tactics when traveling with our kiddos is to pick a hotel near a local park to give the kids easy access to a place to burn off energy. This hotel is not right next to Falls Park, but it is the next best thing. 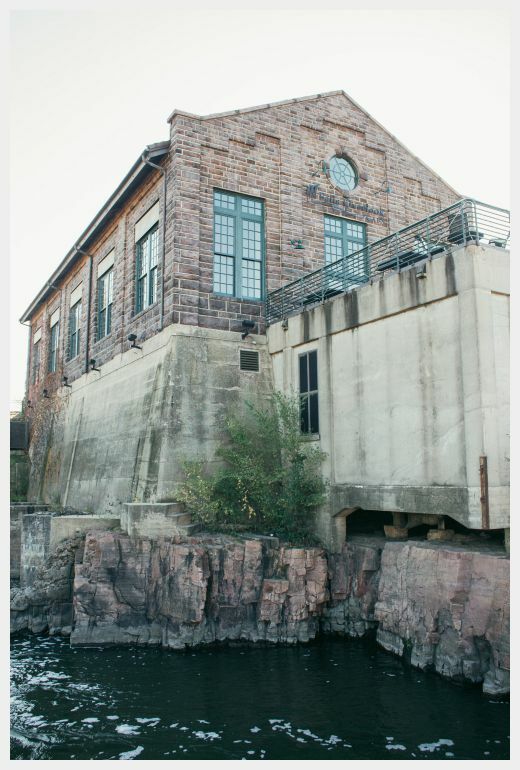 It is right on the Sioux Falls Trolley route, only a short ride away. This hotel offers a great package of features for families. It is the home to an awesome indoor waterpark. The waterpark has a zero depth wading pool for tiny ones, and a deeper area of the pool with a waterslide for bigger kids. All rooms include free hot breakfast. The hotel offers a great family suite with two separate sleeping areas and TWO BATHROOMS! Great reviews on Tripadvisor clinched my recommendation of this family friendly favorite. This is my recommendation for a budget friendly, no frills hotel for those who don’t need all the bells and whistles, but still need a clean, comfortable place to stay. The Super 8 Sioux Falls has suites with 2 queen sized beds as well as a sofa bed for families. It offers up complimentary hot breakfast. You really can’t beat the price. Finally, TONS of positive reviews on Tripadvisor (despite its 2 star status, it is showing in in Tripadvisor as one of the top hotels in Sioux Falls) put this on my short list of where we would stay when our family visits Sioux Falls. A cabin at the Sioux Falls KOA can be a great options for families who are looking for a more natural experience or for those on a tight budget. The cabins offer either one or two bunk beds as well as a full sized bed. Bathroom facilities are shared in the campground. The campground has a playground onsite, as well as a pool, mini golf and bike rentals. There is a small, basic shared kitchen as well as laundry facilities available for guests. During select weekend during the summer, they invite in local foods trucks for a unique dining option. The Sioux Falls Trolley is a cheap and easy way to see the main sites within the city. A one day pass is just $1 per adult (kids 5 and under are free). This makes getting around the the main Sioux Falls attractions with kids SUPER easy. If you need to get further than the trolley can take you, Sioux Falls does offer a robust public transportation system within the city. Unfortunately, there are no public transportation options for getting into Sioux Falls from the airport. There are a wide variety of taxi’s and shuttles, as well as your standard variety of rental car agencies for you to choose from. In our experience, you have a better chance of finding transportation with car seats by prearranging with a private pickup service rather than trying to find a regular can in the airport. Like to Travel? Like to Win? Planning a trip to Sioux Falls? Click Here to Enter to WIN a Trip to Sioux Falls, Courtesy of the Sioux Falls Convention and Visitors Bureau. If you haven’t ever seen the Corn Palace (or if you haven’t seen it since you were a kid) you really should. This South Dakota icon is the stuff that great vacation memories are made of. The intricate designs on the Corn Palace are made of corn, grains and grasses in a variety of colors. They are changed each and every year. The Mitchell Corn Palace is located approximately one hour outside of Sioux Falls. Devil’s Gulch is infamous as the place. After successfully pulling off a daring bank robbery in Northfield, MN, Jesse James escaped capture by jumping over the gulch (and leaving his posse behind to be captured). He escaped to Missouri. Today, you don’t need to jump (there is a footbridge) to get a glimpse of history and experience the natural wonder of the gulch (it is located in Palisades State Park, which is worth a visit in its own right). It is located a mere 28 minutes from Sioux Falls. Located just outside of Sioux Falls, SD, the Porter Sculpture park is a collection of roadside kitsch unlike any that you have likely ever seen. The sculptures depict a variety of strange and fantastical creatures, and they are sitting smack dab in the middle of a South Dakota prairie. A few of them are somewhat macabre and may not be appropriate for young eyes. For the most part, this is a great place where your kids can get up close and personal with some really cool, colorful art pieces. They were created by artist and farmer miscellaneous bits of scrap and old machines. A visit is sure to be something that you will never forget! Brookings is only about an hours from Sioux Falls. In addition to being the home of the Children’s Museum of South Dakota, it offers a good variety of other family friendly fare. Notable to me from a quick scan were the South Dakota Agricultural Heritage Museum and the Mcrory Gardens. Was this Sioux Falls Travel Guide helpful? Did you find some great ideas for what to do with kids in Sioux Falls?